Want to Age Well? Sleep On It! Posted April 6th, 2017 by Mike Boyes & filed under Consciousness, Health and Prevention In Aging, Memory, Physiology. Description: As we age we tend to note that we do not seem to sleep as well as we did when we were younger (OK take my word for it). How are the different facets of our night’s sleep affected by ageing and what are the consequences? After you have collected your hypotheses on these questions read the article linked below to see what recent research has to say on this question. 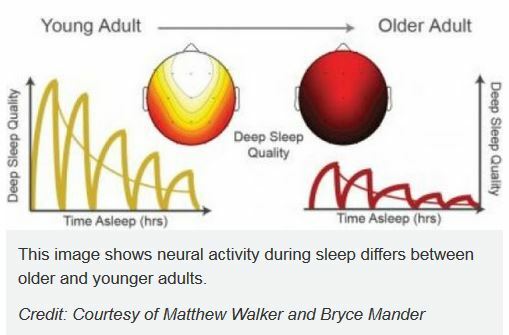 Source: Deep sleep may act as fountain of youth in old age, ScienceDaily. So sleep may be a new frontier in research into healthy aging. Medical tendencies to prescribe sedatives are problematic as they further influence the quality of sleep (and not in good directions). Given the number of serious ailments and issues associated with poor sleep quality and especially with poor quality and low amounts of restful deep sleep we need more research into this area. We need to look at people who sleep well or even better as they age and we need to figure out ways, and not just pharmaceutical ways, to influence how we sleep as we age. What typically happen to our sleep patterns and quality as we age? What do these changes impact in the way of health factors? Who (psychologists, physicians, sleep expertsd?) should take primary responsibility for directing efforts into “future research” in this area and why? Ohayon, M., Wickwire, E. M., Hirshkowitz, M., Albert, S. M., Avidan, A., Daly, F. J., … & Hazen, N. (2017). National Sleep Foundation’s sleep quality recommendations: first report. Sleep Health, 3(1), 6-19. Mattis, J., & Sehgal, A. (2016). Circadian rhythms, sleep, and disorders of aging. Trends in Endocrinology & Metabolism, 27(4), 192-203. Varga, A. W., Ducca, E. L., Kishi, A., Fischer, E., Parekh, A., Koushyk, V., … & Burschtin, O. E. (2016). Effects of aging on slow-wave sleep dynamics and human spatial navigational memory consolidation. Neurobiology of aging, 42, 142-149.